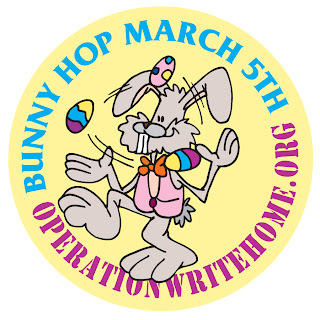 Welcome to the Hero Blog stop on the OWH Bunnyhop! Hope you've been enjoying all the stops ... if you got here from the Stars and Stamps blog, you're doing well in making it one whole stop; if not, go to the Stars and Stamps blog to start at the beginning! lol. Shopping Discount - and CANDY! 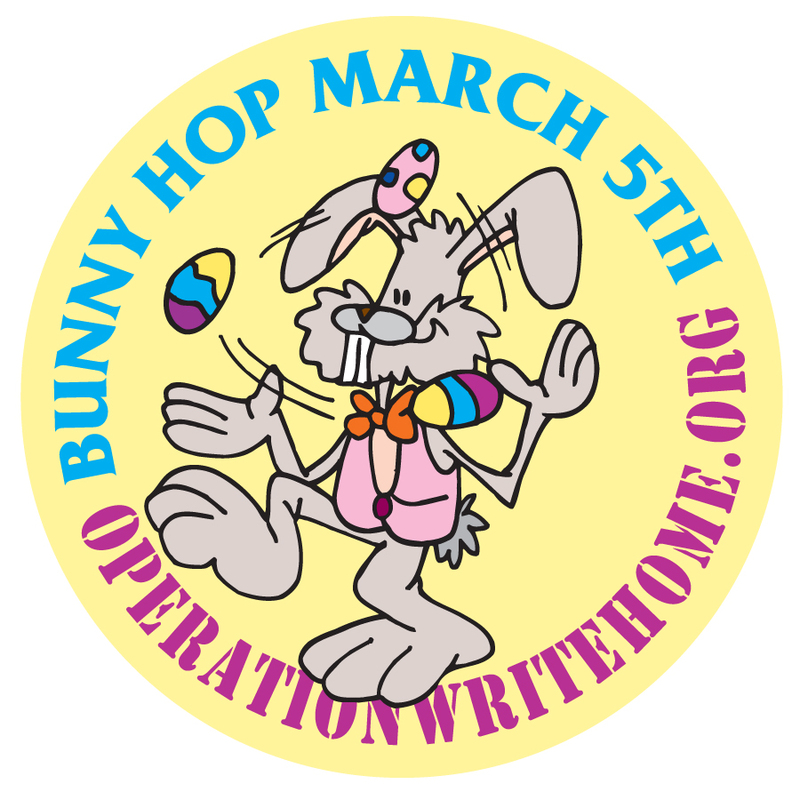 All Bloghoppers get a special BUNNYHOP 10% discount! The BUNNYHOP (case sensitive) discount coupon code is valid from March 5-9 and is good for deep etch rubber stamps (Unmounteds, ClingStamps, and ClingStamps Cut-out). (The coupon will not discount other items like custom stamps, digi's, or cling foam). Customers will need to sign up for a Free Premium membership to activate the coupon (no waiting, the coupon is good after filling in the form). One prize winner, randomly drawn from comments left on this blog post, can pick one rubber stamp and Stampers Best will add some cling cushion and a storage card to ship to them directly. This first card has a vintage look; the flowers were stamped with Memento, colored with Copics, and the panel was distressed with Ranger inks. The background paper was stamped in Versafine Sepia ink, then distressed as well, along with the sentiment. This next card has a totally different look - who doesn't like purple in spring! The ink for the entire card was Colorbox Chalk Wisteria, and the background stamp is the same as the woodcut flowers above. 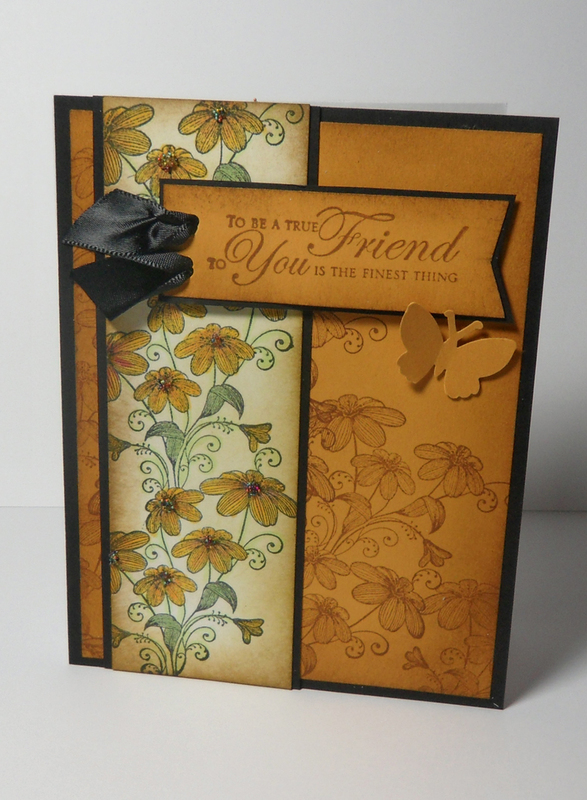 The sentiment is from another Stampers Best set, Someone Special. 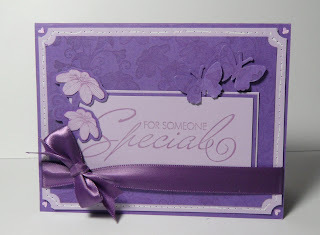 Love the purple card:) I have some scrap purple cardstock that needs to be used, now I have a plan! Thanks! Those are beautiful samples. Thanks Stampers Best for the discount! Beautiful cards, loving the purple. Sandy the cards were beautiful - love these stamps! Beautiful cards, this is a nice stamp! Thank you Stampers Best for such a great offer and prize! pretty stamp set and thanks for the special off this weekend! That is a beautiful stamp. I guess I need to go shopping. What a lovely stamp. And two completely different and gorgeous card creations. So very lovely! What beautiful cards and awesome stamps! The copic colored card makes me wish for spring like weather that much more. Wow! I love the orange card. It's beautiful! Oh, I love both of them. Thanks for sharing and for all the love for OWH. Great cards and offer. I have those woodcut flowers and now have a plan to use them. Love their products. Very pretty cards! Thanks for sharing and for the chance to win! Two beautiful cards--I love how just changing the colors can create something new with the same stamp. Thanks for a chance to win! Exquisite cards, both of them! A huge thanks to Stampers Best for their generous support of the hop. Many thanks to Stamper's Best for supporting OWH. I purchased a personalized OWH stamp from them and it's fantastic! These cards are just stunning. Beautiful. People have a way of making stamps that I wouldn't buy look beautiful so that I HAVE to buy it. WOW! What an awesome image and such beautiful cards! Thanks for the discount! Wow...beautiful images and wonderful cards. Gorgeous cards.. especially love the distressed look! Very nice and THANKS for the discount! A girl can NEVER have too many stamps so i will be shop shop shopping after the hop hop hopping! Beautiful cards. I love the rubber stamp set from the Stampers Best. Thanks for the sample cards. these cards are beautiful!! (of course, I'm a sucker for butterflies!). Thank you for sharing! Goodmorning!!!!!!!!!!!! What a great day for a blog hop!!!! Loved the cards!! Amazing! I love the different looks. Beautiful cards! Great day do hop and shop! Very pretty cards. I like the woodcut flowers and having them in the background on the purple card is really striking! Thanks! Gorgeous Woodcut Flowers stamp set and beautiful cards! Thanks to Stampers Best for supporting OWH! Love the colors on both cards. Love the purple especially. Thanks for sharing and have fun this weekend!! Wow, two very stunning cards!!! I love them both!! How great is this. Thanks so much for sharing and the discount. I love the colors in the cards. Very pretty cards--I like the different looks that were achieved. Love the distressed look. The stitching on the purple card is a nice finishing touch. Your cards are beautiful. I enjoyed reading your thank you notes also. Beautiful cards. The top one is my favorite. This is a beautiful stamps and the cards are beautiful. Beautiful cards! And as a military wife thank you for participating in OWH! Beautiful cards! Thanks Stampers Best for the shopping discount! Those are beautiful cards. I will have to be sure and visit Stamper's Best--I really appreciate their support for OWH. And the thought of condensing my wood stamps to CD cases using the cling foam is super intriguing. That gold card is stunning. Purple is my favorite color so I am LOVING that card! Thanks for sharing. What beautiful cards, I love the stamp you used!! Wow, both of these cards are gorgeous. I just love that woodcut flowers set. TFS. Gorgeous cards! Love, Love, Love the stamp. Does Stampers Best sell wholesale? Would love to bring them into our store, I know my teachers would love to teach with them! love the beautiful cards. especially the vintage one. Beautiful cards! LOVE the monochromatic look of the second! beautiful cards - both are so different and just lovely~! Love that stamp set. I have not seen it before. Very pretty! Lovely cards!! The vintage look is my favourite, but I like the purple one as well!! What beautiful stamps! I'll have to go check that out when I get tired from hopping. Both cards are beautiful but the first one is gorgeous!! Yet another stamp I need to add to my collection! Thanks for enabling me...lol. Thank you for sharing your talent with us! I love to see the very different looks created by the same stamps. Thanks for the inspiration! Wow - awesome cards - I love anything with flowers on it and these are decorated so nicely. The first card almost looks like its made out of leather, I LOVE that look! Love love love that first card! The colors and coloring and layout... All of it! Amazing how same stamp can make such totally different looks. Both are beautiful!! Both cards are gorgeous! I love the first one the most because I am a autumn color gal. These are so elegant and gorgeous!!!! I just love the beautiful vintage look of the first card... so delicate! Gorgeous cards! Love the more vintage one! Love the purple, so simple. Beautiful cards! Thanks for the inspiration. both cards are so beautiful!! gorgeous cards! I love seeing different cards made with the same stamps. It's so dramatic! The woodcut flowers are beautiful! The cards are gorgeous! I love the vintage look on the first one! Beautiful cards and stamps! Thanks for the generous discount! 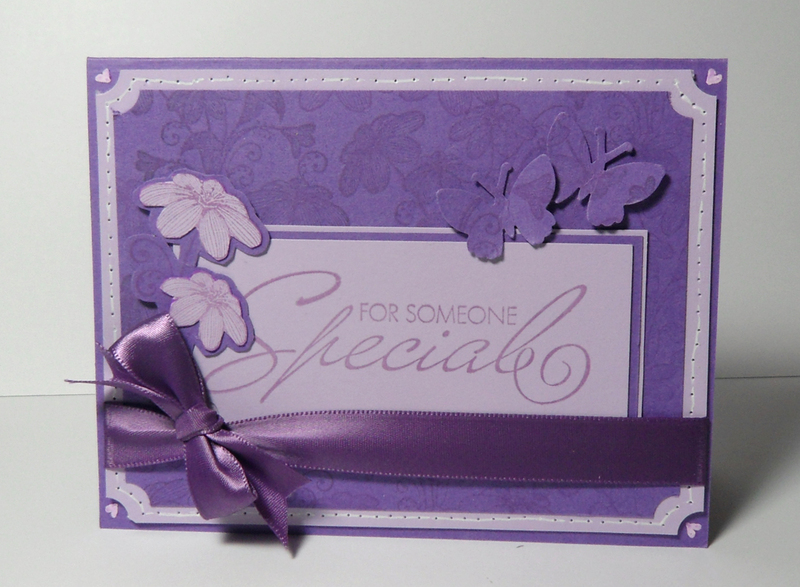 I love the beautiful card (cream and yellow) with the tone on tone and also the purple mono tone card. Fab! Hopped by to see ya! The vintage card is great! Beautiful! I love the vintage one! Beautiful cards and lovely stamps!!! Those cards are beautiful! The stamp they used is really nice and it is wonderful of them to sponsor this Bunny Hop! Many Thanks! Very nice! I really like the warm colors of the first card. Thank you, Stampers Best, for the discount code and the chance to win! Beautiful card. 1 stamp with 2 very different looks. I have a feeling this hop is going to take me all weekend and into next week. Beautiful cards! Really like the first one! Thanks for sharing your great talent! Both cards are very lovely! TFS! Who doesn't love purple...especially in PA in March. Love, love the colors in the cards. Having fun everyone?? This blog is keeping me busy and don't know about you!! Fun looking at all the cards! Love these cards! It is amazing that the same stamp can make to very different cards! Thanks for the blog candy! I love Stamper's Best stamps, and it's easy to see why with just this little sampling! The cards are absolutely gorgeous! What a wonderful work of art you were able to achieve on both of them! Thanks to them for supporting OWH with the stamps for the backs of our cards! Love these cards, what inspiration. I love seeing both of your cards- the image looks entirely different! Awesome hop! Both beautiful... although I love the purple one, the other one is actually my fave of the two. Absolutely beautiful cards. Glad I don't need to pick just one. Love your blog. Great blog hop. TFS Your work is great!! Look at that beautiful stamp set and the gorgeous cards it makes--some lucky someone will be on cloud nine to win this gem. . . .
both cards are great, and i scrolled down and enjoyed reading comments from the soldiers! I love, love, love this stamp! Your cards are so beautiful! thanks for the inspiration! Love the 2 looks from the one set..I'm partial to Vintage and that top card is a perfect mix of color, image ... love it. Beautiful cards and amazing that they could look so different just with a change of color. You are definitely an inspiration. Beautiful stamp, love those flowers. Great creative use of the stamp. Wow, that first card is absolutely stunning!! beautiful cards! Love the colors on both of them!! Thank you for letting me take part in the OWH Spring Blog Hop!!! I really like both cards and absolutely love the stamp. I guess I better go back and look at the stamps. Thanks for the discount offer too. Have a great day! Beautiful cards. Love the color combinations. both cards are gorgeous! Love seeing the same stamp used two different ways! Thanks for this hop to remind us all of the need for these cards! Beautiful samples - that woodcut flowers stamp is gorgeous! I have a friend's husband that is shipping out end of March so this blog hop means even more to me now. Very nice I like them both. Great blog hop. Love the cards and the cause. Great blog hop! GORGEOUS! Love them both but that first one...WOW! These cards are gorgeous... I'm really loving the first one! Thank so much for sharing!!! WOW - this is a gorgeous image good for many themes. Love the look on a strip. For some one special... beautiful theme. The purple color with the shining ribbon makes it lovely.